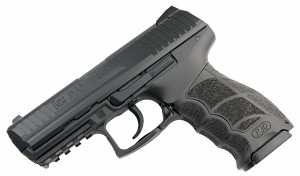 Brand new Heckler & Koch P30 chambered in 9mm, LEM V1 trigger, luminescent fixed sights and two 15 round magazines. Ordered from Top Gun Supply because of their great price. My first HK, the P30 is ergomic, well designed, reliable and the perfect size. I have smallish hands, and find it fits me great out of the box. My friend has large hands, and he said he liked the grip. It has run my various handloads fine. The sights howeve, are OK. There is not enough light around the front sight. I got Henie straight 8s. Great sights. Also got a short left side slide catch lever. The long one is kind of in the way of my time. Everything about the P30 is better than other popular platforms, like Glocks, except for the lesser 15 mag capacity.